US Special Delivery service was established by an Act of Congress on March 3, 1885. At first, this service was only made available in towns with a population of 4,000 or more. 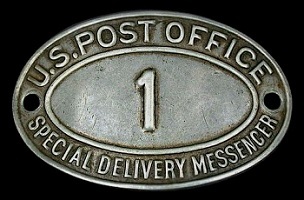 An Act of Congress on August 4, 1886, however, extended the new service to ALL post offices. This service, paid for by additional definitive postage stamps or special delivery stamps, was established for the urgent delivery of letters and packets, in less time than by standard first class mail service. This meant that a letter would be delivered from the destination post office to the addressee immediately upon receipt, instead of having to wait for the next scheduled mail delivery to the recipient's address. The five 10 C. denomination US special delivery stamps shown above were issued between 1885 and 1895. They all feature the vignette of a running mail carrier and additional inscriptions, and, with one exception, they are all printed in blue or deep blue. The special delivery stamp shown above, in the top row at the left (Sc. #E1), has an earliest-known-use of September 29, 1885. This stamp was engraved by the American Banknote Company, perforated 12, and printed on unwatermarked paper. The central inscription reads: "SECURES IMMEDIATE DELIVERY AT A SPECIAL DELIVERY OFFICE". 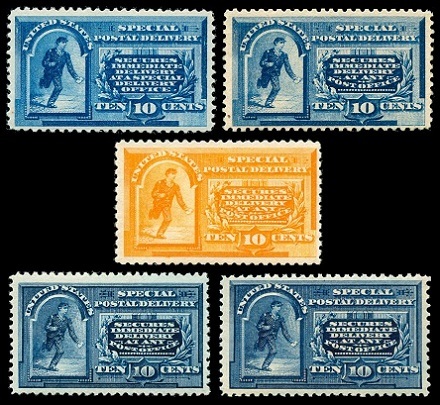 The special delivery stamp shown above, in the top row at the right (Sc. #E2), was issued on September 6, 1888. The attributes of this stamp are identical to the previous issue, with the exception of the central inscription. The inscription reads: "SECURES IMMEDIATE DELIVERY AT ANY POST OFFICE", and this inscription would remain this way for the remainder of the 19th Century. Between January 1893 and January 1894, all the US special delivery stamps were printed in orange or deep orange, in order to avoid confusion with the 1 C. denomination stamp of the Columbian Exposition Issue. The orange special delivery stamp shown above, in the second row (Sc. #E3), was issued on January 24, 1893. The attributes of this stamp are identical to the previous issue, with the exception that it is printed in orange. The special delivery stamp shown above, in the third row at the left (Sc. #E4), was issued on October 10, 1894. This stamp was engraved by the U.S. Bureau of Engraving and Printing, perforated 12, and printed on unwatermarked paper. The engraving is heavier and the background lines are much stronger. There is a line under the inscription "TEN CENTS". The special delivery stamp shown above, in the third row at the right (Sc. #E5), was issued on August 16, 1895. This stamp was engraved by the U.S. Bureau of Engraving and Printing, perforated 12, and it was printed on paper with the double-lined USPS watermark. The new format special delivery stamp shown above (Sc. #E7) was issued on December 12, 1908. The design of this new stamp features the helmet of Mercury, the Ancient Roman messenger of the gods. This stamp was printed in green, dark green, and yellowish green shades. This new design delivery stamp was abandoned, after a couple of years in use, and the older wide-format US special delivery stamp designs returned. As a result, used examples of this stamp are almost as scarce as mint examples. By 1902, that sprinting express delivery mail carrier must have been getting very tired, so, maybe out of sympathy, the U.S. Post Office Department gave him a bicycle to use! 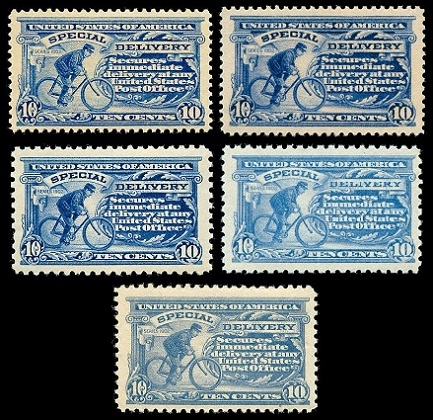 The five 10 C. denomination US special delivery stamps shown above were issued between 1902 and 1917. They all feature the vignette of a bicycling mail carrier and additional inscriptions, and they are all printed in varying shades of ultramarine, blue, or violet blue. The special delivery stamp shown above, in the top row at the left (Sc. #E6), was issued on December 9, 1902. This stamp was engraved, perforated 12, and it was printed on paper with the double-lined USPS watermark. 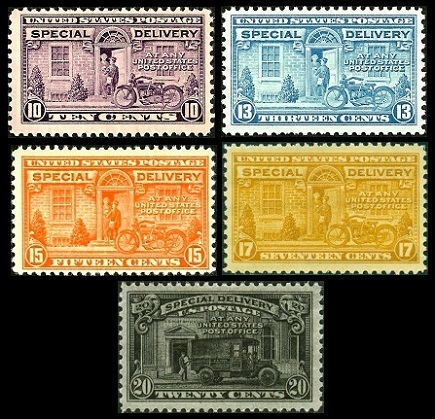 The special delivery stamp shown above, in the top row at the right (Sc. #E8), was issued during January 1911. This stamp was engraved, perforated 12, and it was printed on paper with the single-lined USPS watermark. The special delivery stamp shown above, in the second row at the left (Sc. #E9), was issued during September 1914. This stamp was engraved, perforated 10, and it was printed on paper with the single-lined USPS watermark. The special delivery stamp shown above, in the second row at the right (Sc. #E10), was issued on October 19, 1916. This stamp was engraved, perforated 10, and it was printed on unwatermarked paper. The special delivery stamp shown above, in the third row (Sc. #E11), was issued on May 2, 1917. This stamp was engraved, perforated 11, and it was printed on unwatermarked paper. 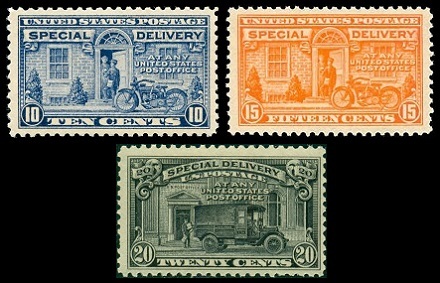 The three US special delivery stamps shown above were issued between 1922 and 1925. These stamps are flat plate printings, perforated 11, and they are all printed on unwatermarked paper. The two designs feature a letter carrier with a motorcycle, and a post office truck. 10 C. (1922 - Sc. #E12) - Gray Violet, Deep Ultramarine. 15 C. (1925 - Sc. #E13) - Deep Orange. 20 C. (1925 - Sc. #E14) - Black. 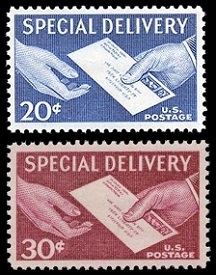 The five US special delivery stamps shown above were issued between 1927 and 1951. These stamps are rotary press printings, perforated 11 x 10 1/2, and they are all printed on unwatermarked paper. 10 C. (1927 - Sc. #E15) - Gray Violet, Red Lilac, Gray Lilac. 13 C. (1944 - Sc. #E17) - Blue. 15 C. (1931 - Sc. #E16) - Orange. 17 C. (1944 - Sc. #E18) - Orange Yellow. 20 C. (1951 - Sc. #E19) - Black. The Postal Service Act of February 28, 1925 provided for special handling stamps for use on fourth-class mail. These stamps would enable the expeditious handling of fourth-class parcels, in the same manner accorded to first-class mail. 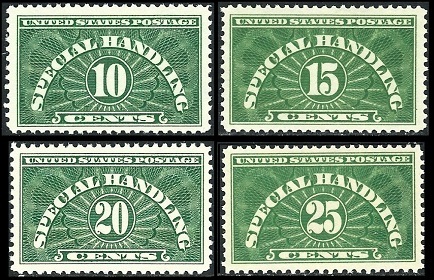 The four special handling stamps shown above were issued between 1925 and 1955. The three lower denominations come in both wet and dry printings, with the wet printings being the more costly. The simple banknote-type design features denomination numerals. 10 C. (1928 - Wet Printing - Sc. #QE1a) - Yellow Green. 10 C. (1955 - Dry Printing - Sc. #QE1) - Yellow Green. 15 C. (1928 - Wet Printing - Sc. #QE2a) - Yellow Green. 15 C. (1955 - Dry Printing - Sc. #QE2) - Yellow Green. 20 C. (1928 - Wet Printing - Sc. #QE3a) - Yellow Green. 20 C. (1955 - Dry Printing - Sc. #QE3) - Yellow Green. 25 C. (1925 - Sc. #QE4a) - Deep Green. 25 C. (1929 - Sc. #QE4) - Yellow Green. The use of these special handling stamps was discontinued in 1959. The 20 C. denomination special delivery stamp shown above, at the top (Sc. #E20), was issued on October 13, 1954. The 30 C. denomination special delivery stamp shown above, at the bottom (Sc. #E21), was issued on September 3, 1957. The common design of these stamps features a special delivery letter being handed to its recipient. The 45 C. denomination special delivery stamp shown above, at the top (Sc. #E22), was issued on November 21, 1969. The 60 C. denomination special delivery stamp shown above, at the bottom (Sc. #E23), was issued on May 10, 1971. 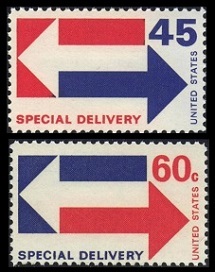 The common design of these stamps features arrows. No special delivery stamps were printed or issued after 1971. The United States Postal Service "officially" discontinued special delivery service in 1997. 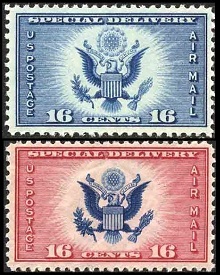 The very brief issue of US airmail special delivery stamps was intended to prepay both the airmail letter fee and the special delivery fee with one postage stamp. These stamps were not issued after 1936, at which time the fees for special delivery service on airmail letters would have been paid by the addition of regular special delivery stamps. The 16 C. denomination airmail special delivery stamp shown above, at the top (Sc. #CE1), was issued on August 30, 1934. The 16 C. denomination special delivery stamp shown above, at the bottom (Sc. #CE2), was issued on February 10, 1936. The common design of these beautiful airmail special delivery stamps features the Great Seal of the United States.